I took this in Richmond Park. I grew up in London and spent my childhood roaming around the park. Its one of the few places I imagine you can see feral Red Deer so close to a city center. 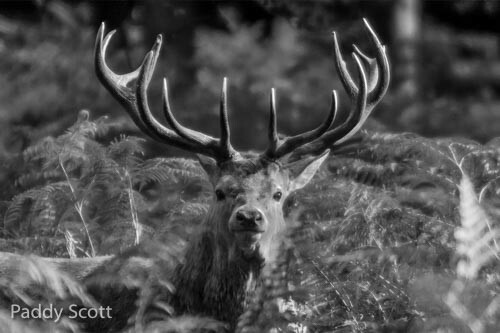 I was creeping through shoulder high bracken and knew there was a stag close from the distinctive smell they give of during the Rut to attract the females. Then suddenly a head popped up. We looked at each other for a few moments and I had time to take a quick frame before the stag ran off.